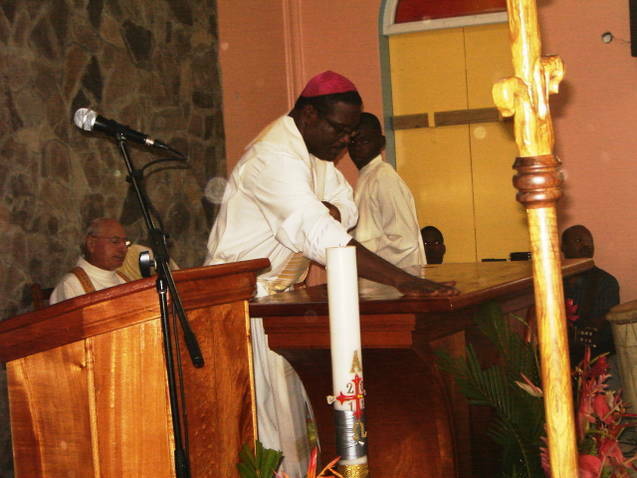 On Monday June 29, 2015, Bishop Gabriel Malzaire, Bishop of Roseau re-dedicated this chapel. We know from the diocesan records that in 1779, the Parish of St. Peter had a resident parish priest named Rev. Fr. Gatin. At that time and for a long time after, Colihaut and Dublanc were distinct enclaves, far from Portsmouth and Roseau and only reachable by boat. Even in the early 20th century visiting Colihaut and Dublanc had its challenges. Bishop Philip Schelfhaut C.Ss.R., who was Bishop of Roseau from January 1902 till his death on May 22, 1921, visited the parish during his pastoral visit in January 1920 and travelled “in a piroque manned by three oarsmen and a pilot. The sea at certain corners was rough; yet they covered the distance from Portsmouth in about 1 ½ hours”. The diocesan records states that Rev. Fr. Paddington,who was parish priest of Colihaut, resided mostly at Dublanc, which was described as “a pretty large hamlet some two or three miles to the north of the Colihaut” His stay, however, was of short duration as he became incapacitated by illness. He died in 1849 before he was able to receive medical assistance. In 1874 a humble chapel was put up at Dublanc by Rev. Fr. Camil Marchel , who died on 12 November 1876 in Colihaut. This chapel was blown down, a few years after his death, presumably in the terrible hurricane of 1883. A new chapel was built on the same spot. Rev. Fr. Jules Francois Michel (+1901) erected a temporary chapel in 1885, where he used “to offer Holy Mass and to give Holy Communion to the old and infirm people who were unable to go to Colihaut.” The chapel did not stand the test of time and it soon disappeared under the relentless assault of the elements. In 1916 Rev. Fr. Francois Charrieau FMI raised the chapel in Dublanc from its ruins. However just before completion, a hurricane leveled on 28th August 1916 all that was erected to the ground. In 1925 a larger and stronger structure was built and this chapel withstood the hurricanes of 1928 and 1930 and 1934. By that time the Colihaut Parish was no longer the prosperous and populous district of the past as the destructive hurricanes of 1916 and 1934 destroyed all the coffee plantations. 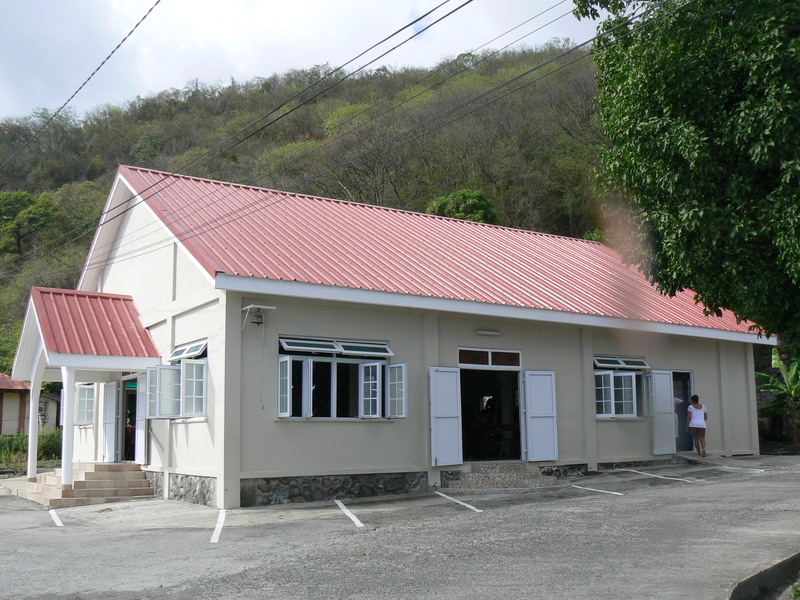 In 1978 a new chapel was built by Rev. Fr. Jean Guérry FMI. The architect was a local man Cuthbert Joseph. The chapel was built with a lot of coud de main or selfhelp. Bishop Arnold Boghaert blessed this chapel on July 4, 1976 and dedicated it to the Miraculous Infant Jesus of Praque. This chapel survived Hurricanes David (1979), Frederick (1979) and Allen (1980) without any damage. It served a growing vibrant congregation well for many many years. Rev. Fr. Celsus Auguiste enlarged the seating area as attendance was growing under his dynamic leadership. He also did some improvements and beautifications in 1988. The recent renovation works were needed as the elements, not to mention the terrible sea blast of hurricane Lenny, took their toll on the 35 years old building. The renovation project was initiated by Rev. Fr. Godfrey Tarimo in January 2010 when he applied for funding to ADVENIAT in Germany and PROPAGATION OF THE FAITH in Rome. By that time, the community had raised a substantial amount of money towards this project. The project was pursued by Rev. Fr. Nigel Karam, pastoral administrator of the Colihaut Parish in 2012. 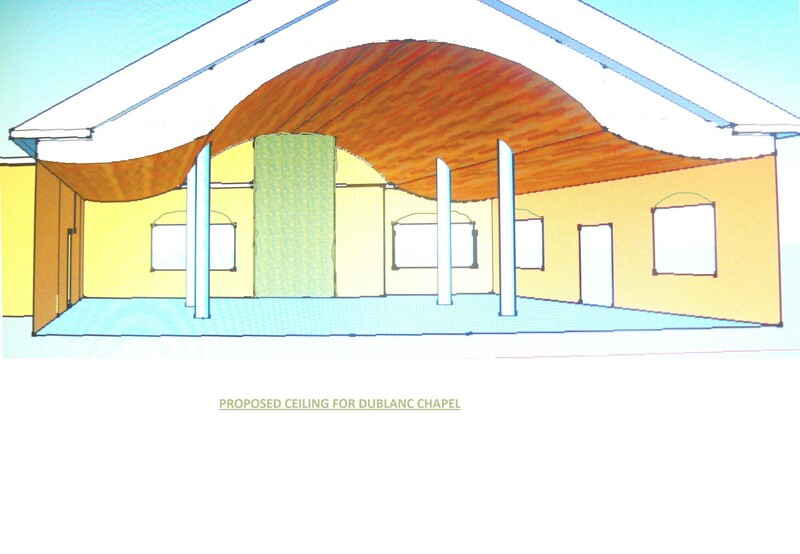 The design for a new roof and curved ceiling and the eastern orientation of the chapel, designed by Bernard Lauwyck, the Diocesan Engineer was approved by the chapel building committee and Fr. Karam in March 2012. The parish of St. Peter was without parish priest from July 2012 till the end of 2013. Monsignor William John Lewis, who was helping out, supported the project wholeheartedly. The Dublanc chapel community continued to raise funds and worked with the Diocesan Engineer to get the renovation works started. 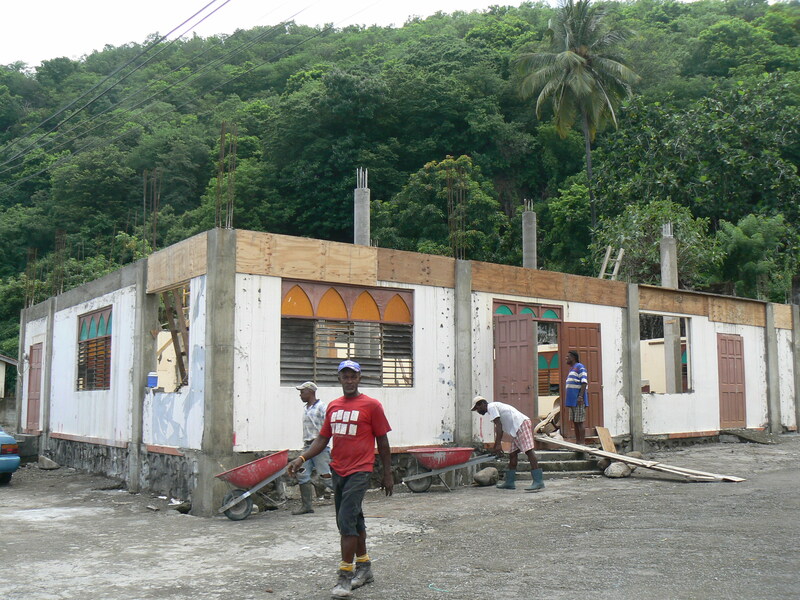 After Carnival 2013, the community moved for worship into a temporary building called “the house”, which was however leaking terrible and difficult to access when it rained. 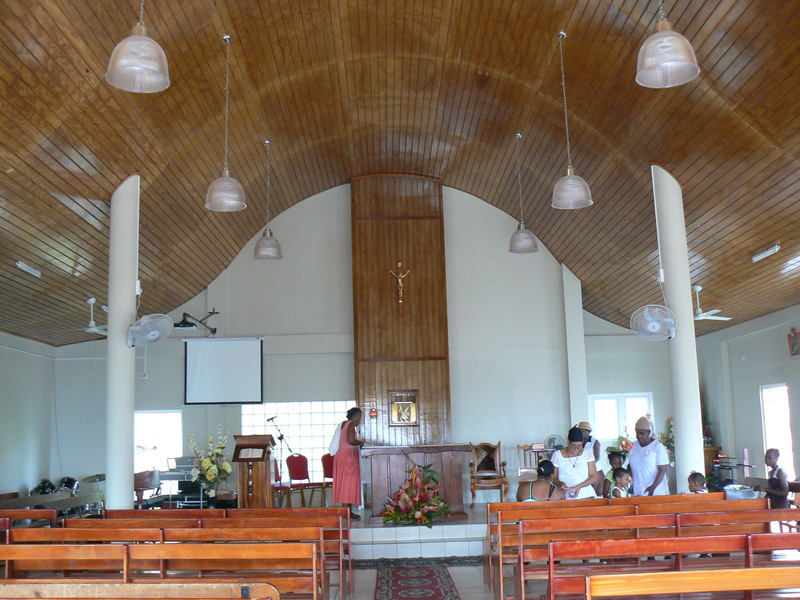 In March 2013, the chapel community came together to remove the old roof and ceiling. This was done on a voluntary basis and saved a considerable amount of money. The renovation works were started in May 2013 by contractor Hughbert Joseph. who completed the roof and supporting structure by October 2013. It was during the period that Rev. Fr. Glanville Joseph was priest in charge of the parish that the PVC windows and doors were installed. This was before Christmas 2013. In the beginning of 2014, contractor Brian Charles constructed the curved ceiling and completed the eaves. By that time the Bishop obtained a donation of ceramic tiles from Food for the Poor. All this work was substantially completed by April 2014, and the community moved back in the renovated chapel under the direction of Fr. Johnmark Ogu, the new Parish priest on Palm Sunday 2014. Electrical work still had to be completed , which was done by by Vesta Anselm. 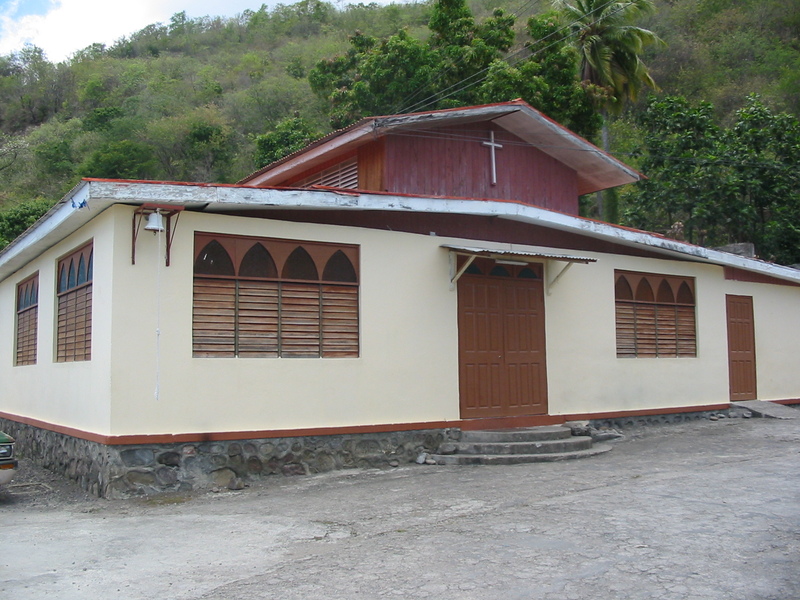 To complete the chapel, Clemon Francois constructed the entrance portico. Many many parishioners gave valuable self help or coud de main to this project and need to be commended for this. This entry was posted in design by Bernard Lauwyck, DUBLANC CHAPEL, RENOVATED CHURCHES and tagged DUBLANC chapel, renovation of chapel on June 30, 2015 by Bernard Lauwyck. and a resident priest from February 16th, 1752. On that date Father Lamaisonneuve, Cordelier or Franciscan Friar, who had arrived in Dominica from Martinique in 1749 and been stationed two years at Grandbay as parish priest, was transferred to St. Joseph. From the end of 1759 all the baptisms of St Joseph and neighboring hamlets were administered and all marriages blessed in Roseau. In an act of 1773, preserved in Roseau, it is expressly stated that there was no resident priest at St Joseph. The parish was not reorganized till 1825. A scrap of a document signed by William Nicolay, Governor of Dominica, states that on the 24th of July, 1825, the people of the parish of St. Joseph had assembled after High Mass, at the sound of the church bell, in the house of Mr. Jean Baptiste Riviere, to deliberate on the election and nomination of a parish priest and a church warden. This was an old French custom which had survived from the time of the French occupation. They unanimously and with the approval of His Excellency William Nicolay and the Ordinary of the said island of Dominica, nominated the Rev. Father Philip Ximeno parish priest, and Mr. J.B. Riviere church warden of the parish of St. Joseph. According to the document drawn on this occasion father Philip Ximeno was officially appointed the first parish priest of St Joseph. At that time, the church was situated on the north bank of the St Joseph’s river, on the grounds of Mr. J.B.Riviere. It consisted of walls: “plastered with mud “, a roof “thatched with straw” and flooring “with boards”. (According to the ECCLESIASTICAL BULLETIN OF ROSEAU). Padre Philip Ximeno, a Spanish priest, remained in charge of St. Joseph till 1828. In 1828, on May 25th, Fr. 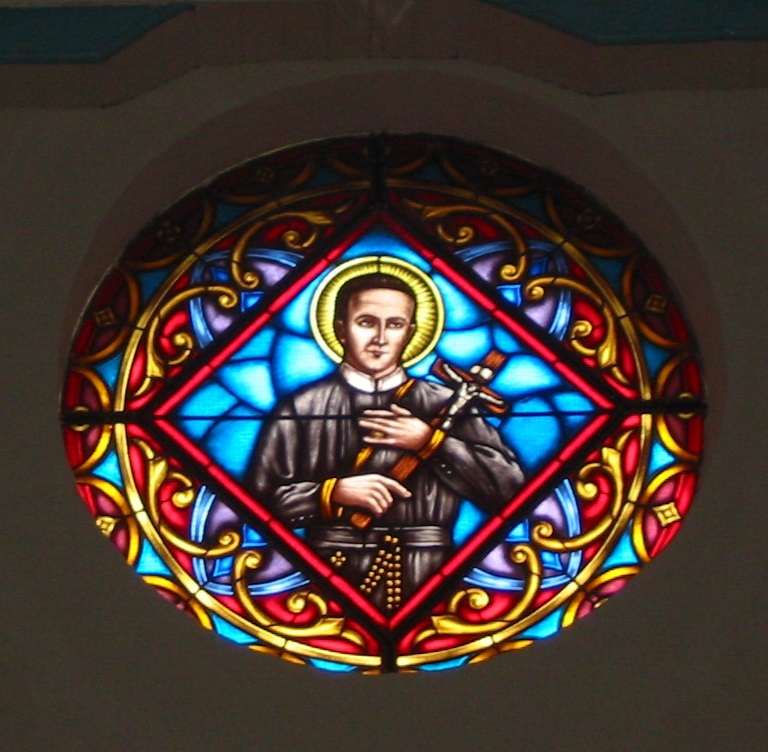 Philip Ximeno succeeded his uncle Jean de la Hoz Ximeno as parish priest of Roseau. His tenure only lasted a few months as Fr. Francois Morin was officially appointed Parish Priest of Roseau by the Apostolic Vicar Daniel McDonnell in 1829. He visited St. Joseph off and on, but there was no resident priest in St. Joseph during that period. From 1834, there appears in the parish records the name of Fr. De Lort, who signs “Curé”, although he was parish priest of Colihaut only, and not of St. Joseph. Yet, he built a new church at St. Joseph, a cruciform building in stone, and blessed it, together with a church bell, on July 9th, 1846. The church was to a great extent was built by the generosity of Mr. J B Riviere, who departed this life before the completion of the church. From 1847 till 1852 there was a resident priest in St. Joseph named Father Sallon. He was succeeded by Father Zannetlini, who was officially appointed and solemnly installed on the 24th of February 1853 by Vicar General Edward Patrick Smith. Father Zannetlini recorded that : “The parish has no presbytery and no furniture. The church is thoroughly neglected; there are no doors and no locks. The church furniture consists of one monstrance, one ciborium, one censer and four chasubles, a single one of which is not worn out. There is only one alb , and no funds whatsoever available.” Four months later he resigned his office and soon left the island. 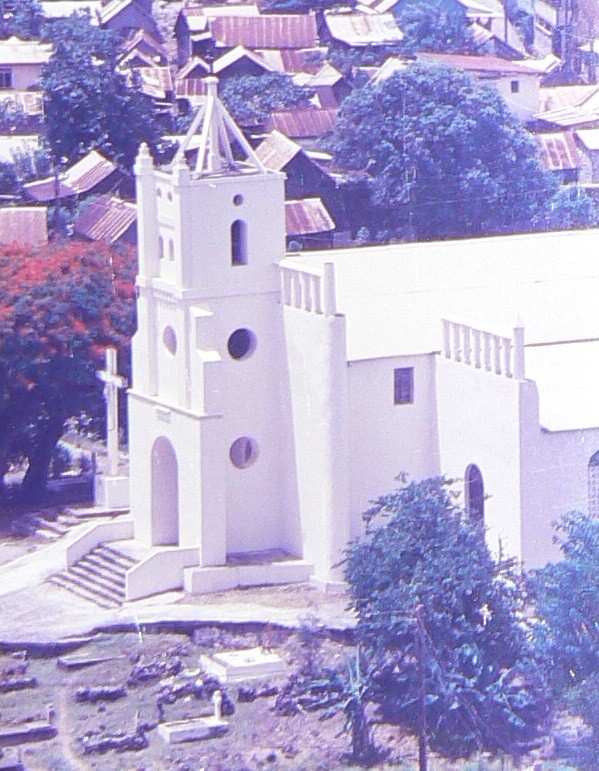 In June 1853, Father Boué took possession of the parish with full authority vested in him by Monsignor Edward Smith, Vicar Apostolic of Port-of-Spain. He remained parish priest up till 1855. 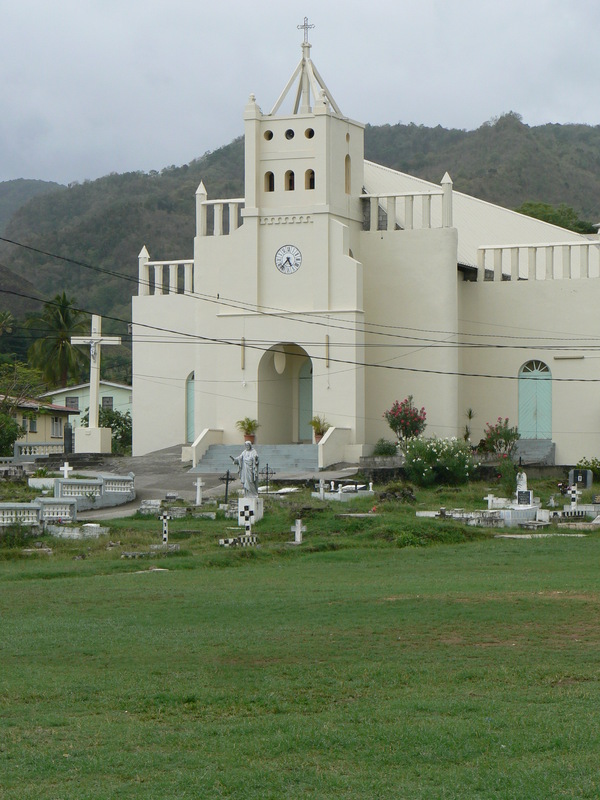 By that time, Dominica had become a Diocese with a Bishop based in Roseau. Father Boué did not stay long either as Fr. Bompart took his place in June 1855, but left less than 3 years after. Many people may not remember that St. Joseph was known as “a fever hole” and that several missionaries sacrificed their health and lives in an effort to bring the word of God there. And so it was with Fr. Jean August Vabret, of the Eudist Order from France, who became parish priest in St. Joseph at the end of 1859 and was dead by September 1860. Needless to say that the construction works on the church in St. Joseph did not progress at all. For two years the parish remained without a pastor, and had to be attended to from Roseau and Mahaut. In the middle of 1862, Father Jacques Philippe Lacot, of the Eudist Order, arrived from France and was at once appointed parish priest. His missionary career in Dominica was as short as his predecessor’s: after a lingering illness he died of congestion of the lungs in October 1863. He was buried in the church of St. Joseph. For a time the district was served again by a priest out of Roseau, Mahaut, Colihaut or Portsmouth. In January 1872, Father Lorgeau was appointed parish priest of St. Joseph. Father Lorgeau was born in France and had been for ten years a missionary in Guadeloupe. Afterwards he became parish priest of Capesterre, in Marie Galante, where he soon got into hot water. Driven from his parish by political factions, he embarked during the night on a small rowing boat and was brought to Dominica by some faithful friends. He came however with excellent testimonials and Bishop Poirier accepted the fugitive priest with open arms and appointed him first parish priest of Mahaut and next in 1872 of St. Joseph. Soon after his arrival in his new parish, he determined on enlarging the small St. Joseph church, which have become altogether insufficient to accommodate the ever-increasing population in 1874. The façade, built in 1846, was pulled down; pillars and arches were built inside the old church and the two side-chapels extended. In March 1875 the Bishop went to St. Joseph in order to close the ceremonies held in honour of St. Joseph, and to bless a new statue of the Patron Saint of the parish. Broken in health, Fr. Lorgeau kept working hard till 1879, when the parish had to be attended to again by parish priests of Mahaut and Colihaut. Neither the one nor the other, however, was able to continue the building. It is not until the middle of 1881 that a new parish priest for St. Joseph became available, in the person of Fr. Louis N. Martineau, a native of Martinique, ordained in Roseau in 1875, and since then parish priest of Portsmouth, Dominica. Energetic and enterprising, he was determined on completing the church by building the façade and completing the two wings. The first stone of the façade was solemnly blessed on November 20, 1884 by Bishop Michael Naughten [1880-1900], successor of Bishop Poirier. The collection taken up on this occasion towards the new building was disappointing; and so it is not surprising that on January25, 1887, the Bishop visited the parish for confirmation and “ severely upbraided the congregation for their indifference and neglect with regard to the finishing of their church, now so long in that unfinished state, more than seven years before he came to Dominica as Bishop”. The church was still far from completion when Father Martineau departed this life in October 1889 after a long and painful illness. The parish was once more without a pastor. In June 1891 Fr. Theodore Gerbier FMI was put at the head of the parish for four years. 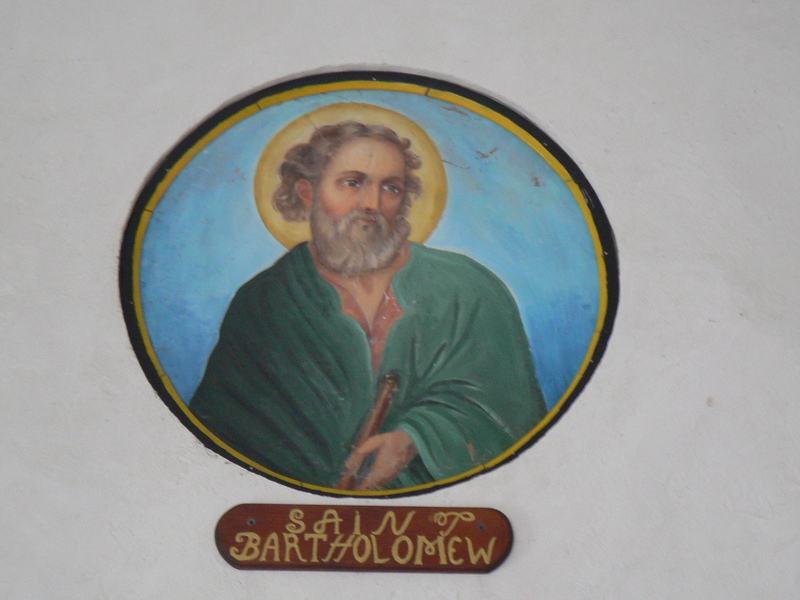 He was determined to work “not only to the spiritual welfare of his flock” but also to the completion of the parish church. He finished the front of the church and the side aisles. 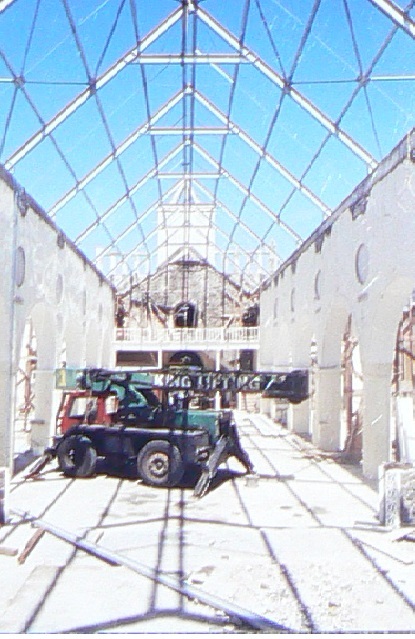 He also put new galvanized roof sheets on the whole church and imported a “fine high altar made of steel”. Redemptorist Fr. Alfred Stainforth was appointed parish priest in 1916. His first concern was the beautification of the church to make it a worthy place for God and Catholic liturgies: he installed a stone floor in the church, built a new set of pews and put up a communion rail. A few years later, he built a side chapel with a large baptistery underneath, and erected the beautiful tower, “which will remain for generations the pride of the parishioners of St Joseph”[according to THE ECCLESIASTICAL BULLETIN OF ROSEAU (EBR) ]. The hurricane of September 1, 1930 damaged the St. Joseph church roof badly. Bishop James Moris reported that “thousands are without shelter, their houses having been reduced to a heap of ruins. All provision gardens have been swept clean by the onslaught of the elements. Nearly all lime trees, cacao trees, coconut trees, banana and others lay broken or uprooted, to die in the blazing September sun. Unless people begin seriously to plant provisions, and yet again provisions, and that without the least delay, famine may be at our doors before weeks”. We are not sure if Father Felix Boghaert, another Belgian Redemptorist, was appointed parish priest before or after the destruction caused by this hurricane in 1930. 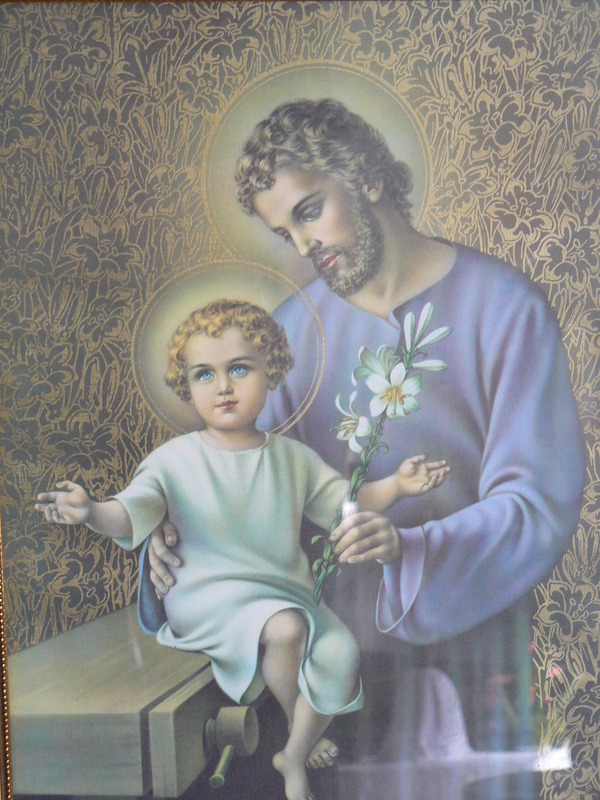 In any case, he started to enlarge the parish church as the church attendance and population of St. Joseph was growing . It is a familiar phenomenon that people are driven back to church and God after a disaster, and this might have been a contributing factor to the need to enlarge the church building . Fr. Felix also built the present presbytery adjacent to the church. I want to briefly mention Fr. Valère Vanackere C.Ss.R, who was appointed parish priest of St. Joseph on the 23th November 1963. He was deeply loved by the people. He carried out repair works on the church by breaking down the spire of the tower and replaced it with concrete. He also got the façade of the church plastered. It was during his time that in response to the decisions made at the Second Vatican Council, the interior of the church was drastically changed : the old altar as well as the steel High Altar were broken down and refashioned so that the priest would face the congregation during Mass. Fr. Paul Loncke C.Ss.R replaced Fr. Vanackere for a short spell of 7 months. During that period history was made, as for the first time, a woman read the epistle at Holy Mass, something which was not allowed before. He name was Mrs. Hilda Bruno. We now move to recent times : Fr. Rodney Olive C.Ss.R can be credited with the construction of the beautiful arch at the church grounds’ entrance and the construction of the cemetery walls. In 1988 Fr. Glanville Joseph C.Ss.R discovered cracks in the tower. After inspection and investigation, it was determined that the tower’s foundations were built on graves. To avoid disaster, the tower foundations were strengthened and the tower re-plastered and re- painted (see picture above). All this was done in 1989. Fr. Vanty Auguiste C.Ss.R was parish priest in St. Joseph from the August of 1999 to July of 2005 and a lot was accomplished by him during that period, not only on the pastoral level. He renovated the entire church : floor and tiling, columns, sanctuary and sacristy, new altar . The old timber roof was completely replaced by a new steel roof and ceiling. The electrical installation was replaced and updated . New doors and windows were installed and the church got a complete face lift by painting and decorating. Mark Owen, C.Ss. R repainted the cemetery walls and most of the graves. Also new gates were installed. This shows that a lot of work has been done during the last 100 years on the St. Joseph church to make and keep it a beautiful Place of Worship. 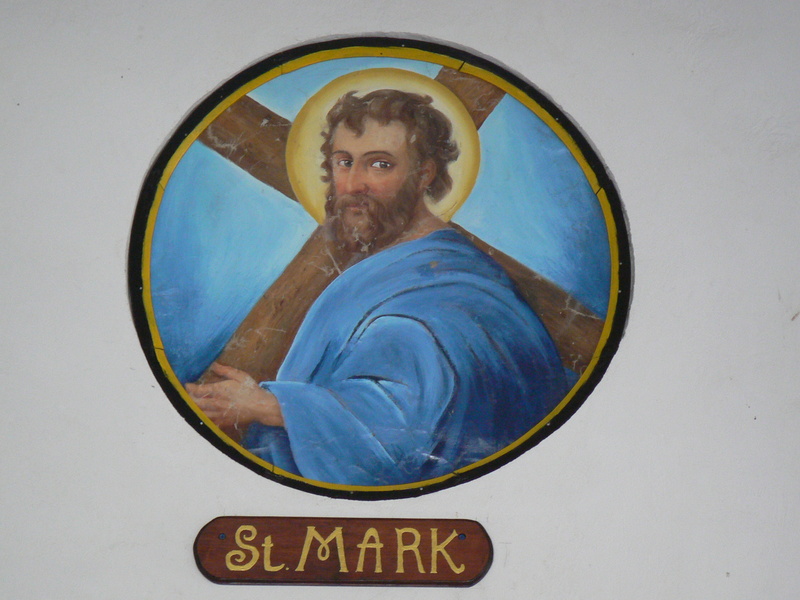 This entry was posted in RENOVATED CHURCHES, St. Joseph church in St. Jospeh and tagged st. joseph church in st joseph on June 8, 2015 by Bernard Lauwyck. The building of this new chapel was a LABOUR OF LOVE.  A Labour of love for Fr. Sharplis , who came up with the idea to have this chapel dedicated to OUR LADY OF GUADALUPE. 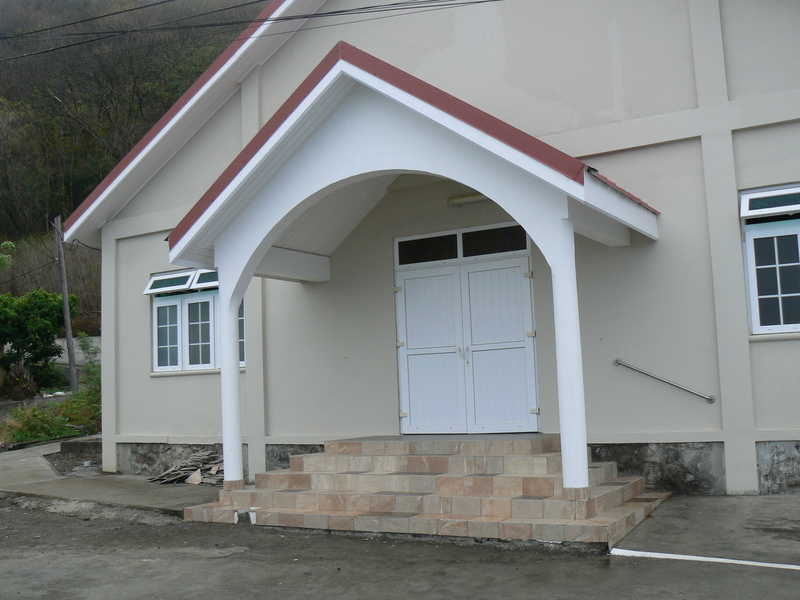  A labour of love for the many hands who worked on this chapel, under the supervision of Mr. Patrick Jno Baptiste and Mr. Jefferson JAMES, and the many people who donated and contributed. The people who settle the ownership of the land. 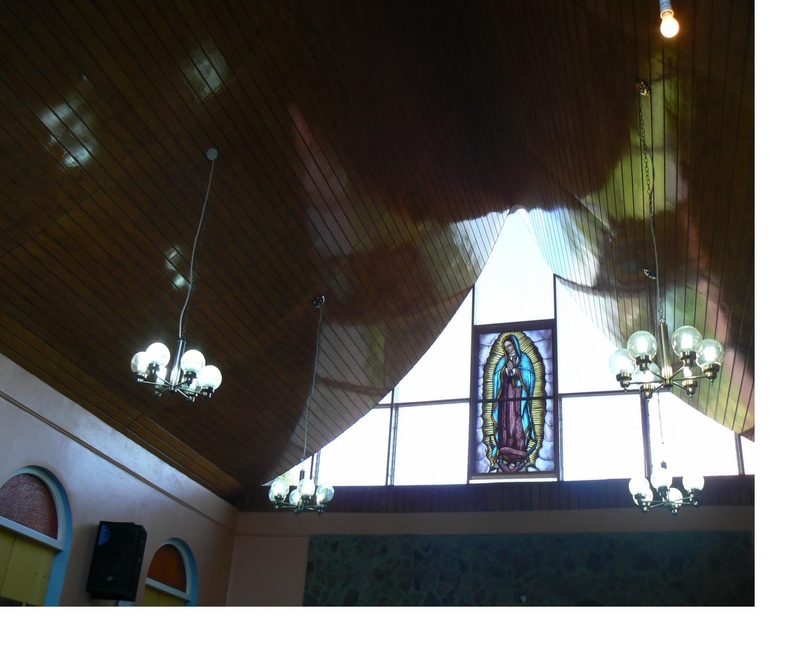  A labour of love for me, the designer of the chapel and I was also very much involved in the beautiful curved ceiling, arched windows & doors and stained glass window. Today, our Bishop has DEDICATED this chapel to Our Lady of Guadalupe and CONSECRATED the altar, a table set aside for the celebration of the Eucharist. First of all, as all great Cathedrals, this little chapel is facing EAST, you are sitting, praying and celebrating facing East. In Ezekiel 43 we read : ”The glory of God comes from the east” The rising of the sun in the East each day has been seen, since early apostolic times, as a symbol of the Resurrection of the Saviour and of His Second Coming. This chapel is facing East. Secondly, ” church buildings, to be used for divine worship, ought to be beautiful and symbolic” Beauty is a powerful means to draw us closer to the Mystery of God. • It will cause us to be transformed so that we in turn can transform the world. We constructed this beautiful chapel to glorify God so that God can sanctify us and make us grow towards salvation. 3. 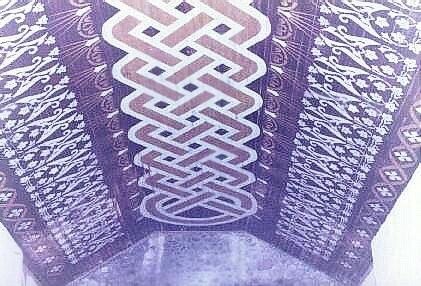 Symbolism : The ceiling with the shape of a tent. We all know the words from JOHN 1:14 “And the Word became flesh and dwelt among us. A literal translation of this passage is “In Jesus, God has pitched his tent among us.”(John 1:14). Pitched his tent among us !! This links the new testament to the old testament where the LORD said to Moses: ” make me a sanctuary, and I will dwell among my people. You must make the tabernacle and all its furnishings following the plan that I am showing you.” (Exodus 25:8-10). This tabernacle was a tent-like sanctuary that the wandering nomadic Hebrews carried with them. The English word “tabernacle” is derived from Latin “tabernaculum” which means TENT. This new chapel with a tent shaped ceiling will be God’s tent, God’s tabernacle, here in BOURNE. After Moses built this tent, this sanctuary, we read The glory of the LORD filled the tabernacle” Exodus 40 : 34. But sometime we forget about the human tabernacle who was filled with the GLORY OF GOD : The humble servant MARY. She is depicted her as she appeared in Guadalupe, Mexico. 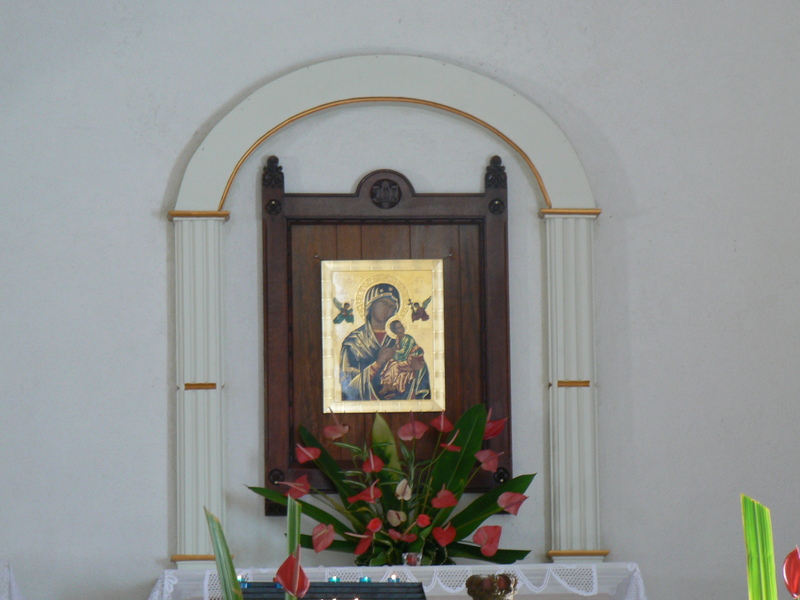 This brings us to OUR LADY OF GUADALUPE, this chapel’s patron . 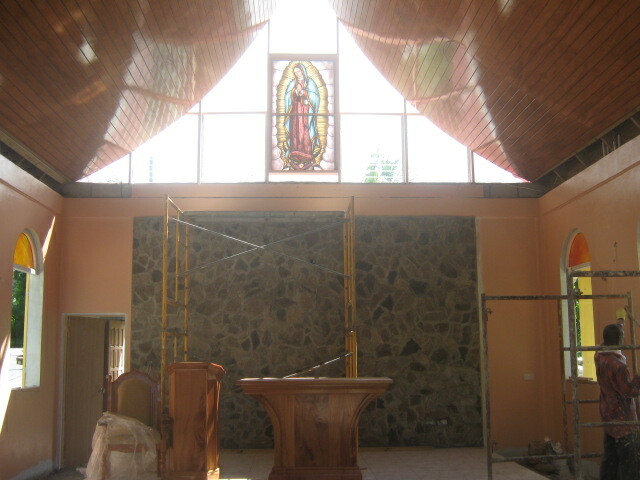 The idea to dedicated this chapel to the memory of the Virgin of Guadalupe was proposed by Fr. Sharplis and accepted by our Bishop Gabriel Malzaire. Above the altar you see the beautiful stained glass window, a copy of the TILMA or cloak that is displayed in the shrine of the Lady of Guadalupe in Mexico City. The miraculous image produced on the cloak of Blessed Juan Diego is rich in symbolism. Her mantle is also studded with many stars : The Eight pointed star. You might remember that only 8 people were saved from the waters of the Flood on board of the ark van Noah. Many baptismal fonts have a 8 sided shape or octagon. The Red Roses on the fascia board facing West. Upon request of evidence of the apparition by the Bishop of the Diocese, Our Lady of Guadalupe provide this miracle : when Juan Diego opened his coat or Tilma , red roses fell on the ground and the image of OUR LADY of GUADALUPE revealed itself on the Tilma. 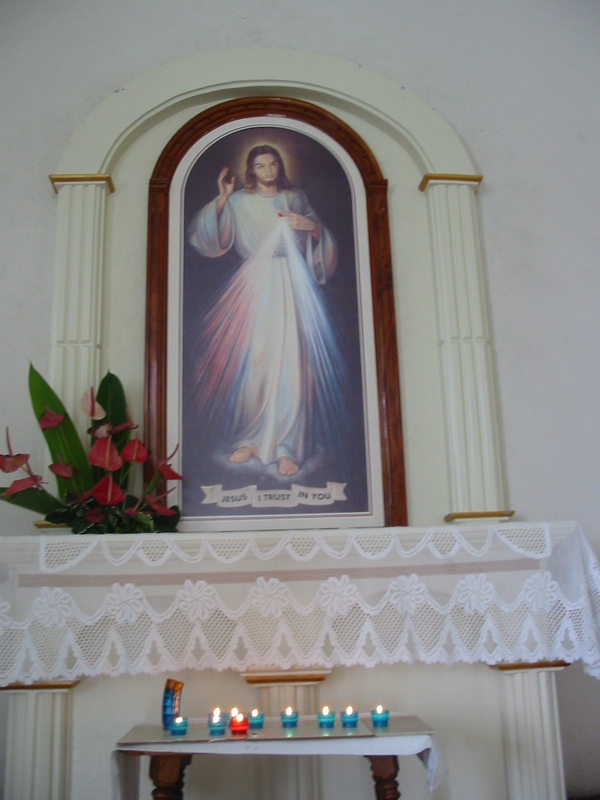 Usually the patron of a chapel of church should be placed at the entrance, but here we have Jesus mother looking down on the altar, the table of her Son’s sacrifice, repeated at every Eucharistic celebration in this chapel. I am the ever-virgin Mary, Mother of the true God who gives life and maintains its existence. He created all things. He is in all places. He is Lord of Heaven and Earth. • All those who sincerely ask my help in their work and in their sorrows will know my Mother’s Heart in this place. • and they will be at peace. So you can see that this is a building full of symbolism and meaning. I hope you will take care of it and put it to proper use. This entry was posted in BOURNE CHAPEL, design by Bernard Lauwyck, NEW CHAPELS or CHURCHES, SUNDAY MASS at 11 am and tagged Bournce Dominica, Bourne chapel, Lady of Guadalupe on June 4, 2015 by Bernard Lauwyck. 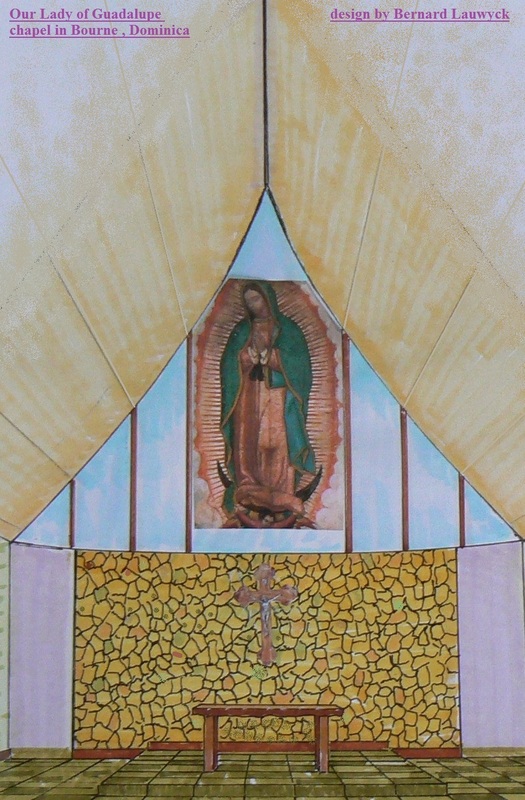 This entry was posted in BOURNE CHAPEL, design by Bernard Lauwyck, NEW CHAPELS or CHURCHES, SUNDAY MASS at 11 am and tagged BOURNE, OUR LADY OF GUADALUPE chapel on June 4, 2015 by Bernard Lauwyck.